A homemade oil that can be used as a topical application to treat minor skin ailments is what I'm gonna share with you all today. Heat a vessel and add 2 tbsp each of Coconut oil and Neem oil . Then add 7-8 stalks of curry leaves along with a few curry leaves (add more of stalks and less of leaves). Heat the mixture over a high flame at first and then let it simmer. Switch off the flame and add ¼ th tsp of turmeric powder to it. No need to strain the mixture. You can use it as it is. By the way, if you want to prepare a larger quantity of this Lepam, then you have to take 100 ml each of coconut oil and Neem oil, 1 fistful of curry leaf stalks and 1-2 tsp of turmeric. When it cools store it in air tight bottle. You can also apply this lepam all over your body and expose the areas to the rays of the early morning sun for 10 minutes. After this brief sun-soaking ritual, have a bath. Especially helpful for those who are afflicted with minor skin ailments, boils, skin eruptions and intense skin itching. May also benefit leucoderma / vitiligo patients to a certain extent. More so, since a recent research has shown that the bark of the curry tree can also be used to treat leucoderma / vitiligo. While preparing this oil for leucoderma / vitiligo patients, you could add a few scrapings from the curry tree bark to make it more potent. Neem oil and turmeric have anti-bacterial and antiseptic properties and hence are the choicest ingredients for treating skin-diseases. 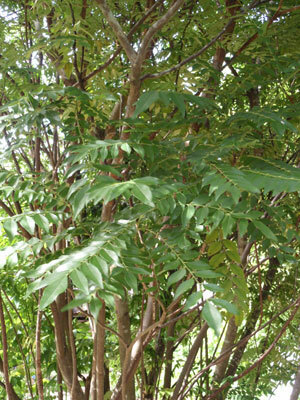 As a folk remedy, paste of curry leaves is often used to treat boils on the skin. Curry leaves boiled in coconut oil is used to treat premature gray hair and hair loss as it is believed to strengthen hair roots as well. Another study has also shown that curry leaves can be used to maintain an even skin tone and help treat pigmentation issues. Curry leaf, allegedly has some SPF factor too. Concocted with such powerful ingredients, this DIY homemade oil is highly effective!